The veteran RPG employees at Doublebear have pulled the tarp off of Dead State, an upcoming zombie-themed RPG. 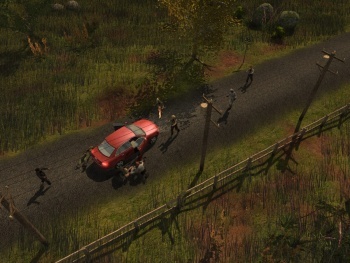 Developer Doublebear had been releasing information about its zombie RPG under the codename ZRPG, but now the game has an official name: Dead State. With a megaton of details revealed in a interview with Rock, Paper, Shotgun, it doesn't just sound like a good zombie game, it sound like a good game period. Dead State puts players in the shoes of the leader of a Texas shelter during the zombie apocalypse. With cities too dangerous to live in, survivors are trying to eke out an existence in the middle of nowhere. Doublebear is made up of veteran RPG developers like Brian Mitsoda, an ex-Obsidian and ex-Troika employee. He paints Dead State as almost something like a zombie apocalypse simulator, with a great amount of freedom given to players. You have to manage the morale of your shelter and loyalty of its inhabitants by accomplishing goals, collecting food, and raising the shelter's defenses while also dealing with the individual personalities of the survivors that join your group. Certain "crisis events" are turning points that will make almost every member of the shelter approve or disapprove, so it won't be easy. Mitsoda says Dead State will have "a large pool of unique survivors" and players won't be able to recruit them all, giving a feeling of randomness to the game. Other groups of survivors in the area must either be convinced to work alongside you or to fear you so they don't come after your stuff. Mitsoda says that there aren't necessarily "bad guys," because the player can make his own moral judgments about who to deal with. Other groups will also interact with each other separate from the player's decisions, or just try to hide completely. Combat is turn-based with players giving orders to their team members rather than fully controlling them. Loyalty and personalities will determine whether these allies listen or not. Mitsoda gives an example: "If your ally is scared of zombies and you tell him to run into a pack of zombies, he's most likely going to ignore the order or do it and possibly start panicking as the zombies start to mob him." Your team in Dead State is not a trained group of commandos, so Mitsoda points out that they won't handle like one, and sometimes you've just got to let some of them die to save the others. Battles work similar to other turn-based RPGs, with Mitsoda revealing Doublebear wanted to capture the "feeling of dread that was a big part of X-Com" though a line-of-sight mechanic. "It's very easy to be in a situation where you turn the corner and there are five zombies waiting there or a case where you fail to properly sweep a bedroom and one lunges out of the walk-in closet while you're about to search the dresser," he says. As for the zombies, they'll be "your very basic shambling corpse." Some crawl, some are on fire, but none can sprint. The full interview with Mitsoda has even more details and is worth reading for turn-based RPG fans looking for something new on the horizon. Dead State will be released "not in 2010," and the only confirmed platform for now is the PC.